The groups serving as ambassadors for volunteerism come in all shapes and sizes, yet their objective is the same: To contribute to the ongoing vibrancy of Lakewood by undertaking initiatives that bolster our city, one neighborhood at a time. These companies and organizations that commit to supporting LakewoodAlive’s mission to foster and sustain vibrant neighborhoods are as varied as they are impactful. In this particular instance, one represents the oldest brewpub and microbrewery in Ohio, the other a local chapter of a global cause-driven organization. 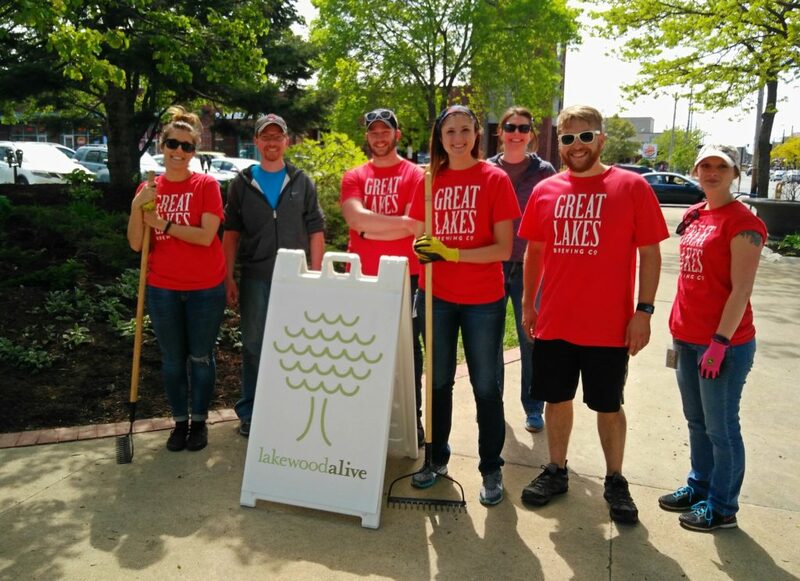 But both Great Lakes Brewing Company (GLBC) and Lakewood Family YMCA recently collaborated with LakewoodAlive to undertake beautification projects for the betterment of Lakewood and its residents. 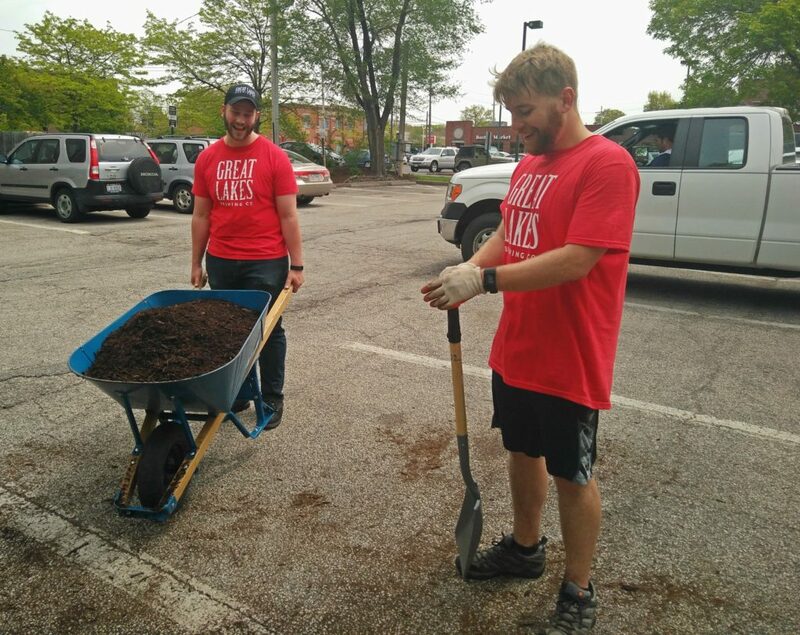 The group from Great Lakes Brewing Company mulched highly-visible areas of Downtown Lakewood on Friday, May 20. 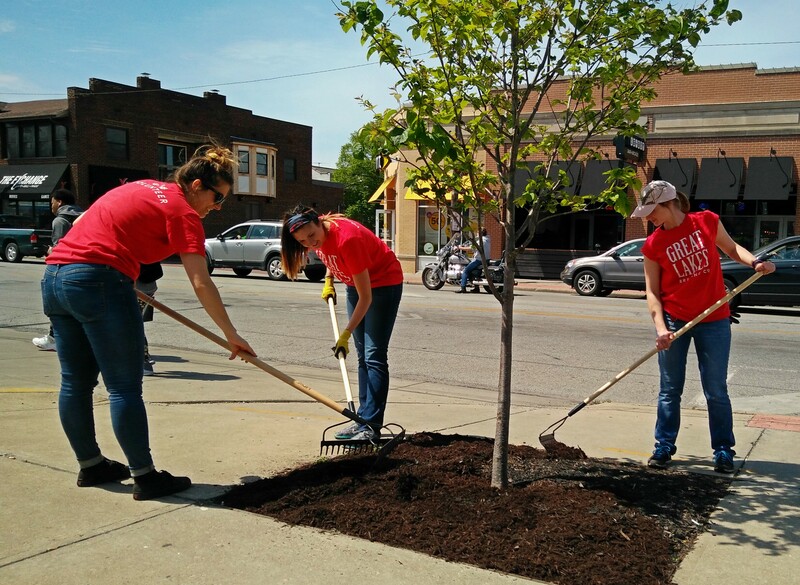 Volunteers from Great Lakes Brewing Company mulch around a tree near Detroit Avenue in Downtown Lakewood. While GLBC prides itself on offering “An Exceptional Family of Beers,” the microbrewery exudes an exceptional spirit for volunteerism as well. 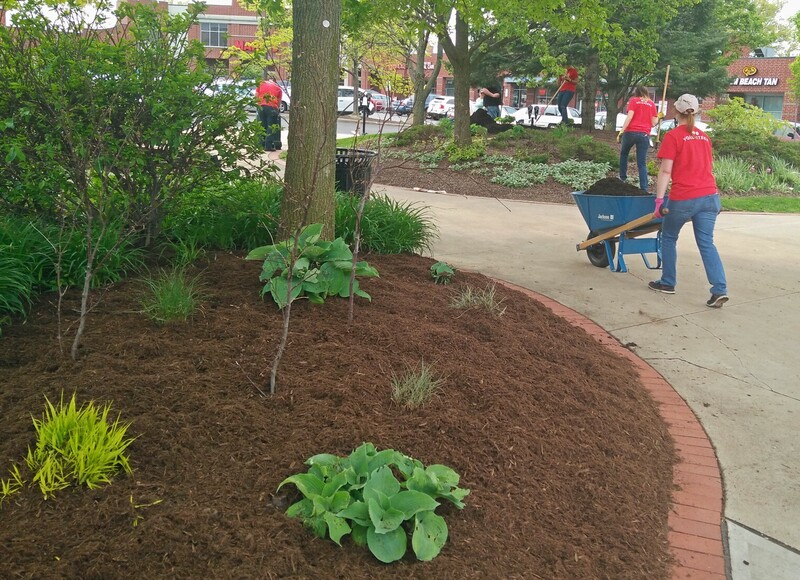 Its dedicated team of volunteers assisted LakewoodAlive with a highly-visible curb appeal project in Downtown Lakewood on Friday, May 20, spreading 15 yards of mulch within the flowerbeds encompassing City Center Park and the surrounding areas of the Lakewood Town Center shopping plaza. Now in its second year, this Downtown Lakewood mulching project represents one of the numerous ways GLBC supports communities within its distribution footprint. The group celebrated a successful project with a trip across the street to Rozi’s Wine House for – what else? – a Great Lakes beer. 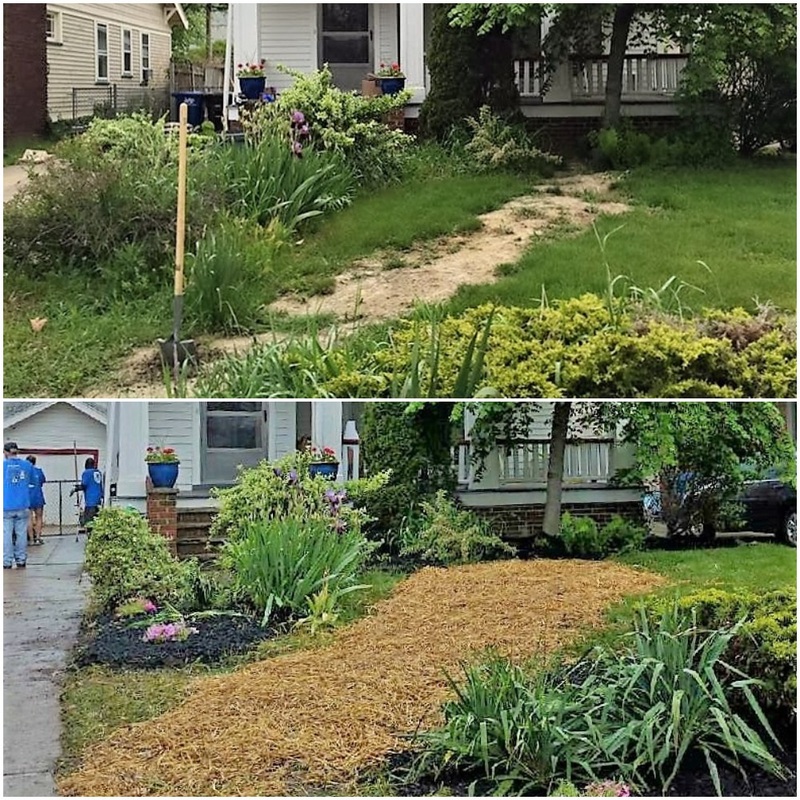 The before-after comparison from Lakewood Family YMCA’s curb appeal volunteer project on Lewis Avenue on May 21. 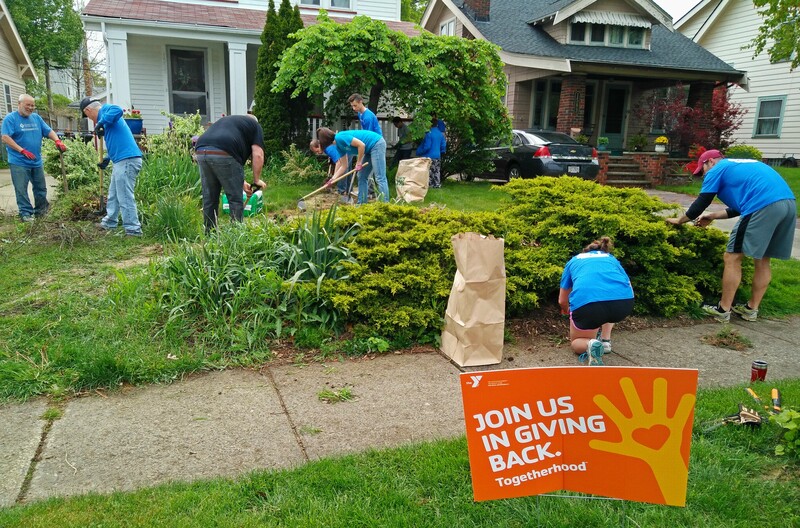 The following morning, on Saturday, May 21, volunteers from Lakewood Family YMCA congregated with LakewoodAlive staff members on Lewis Avenue to partake in a beautification project on behalf of a resident. Part of the organization’s “Togetherhood” campaign, YMCA’s signature program for social responsibility, the project involved weeding, trimming and planting grass seed and ferns. The end-result: A total transformation of the property’s landscaping. Capitalizing on its strength in numbers, the group from Lakewood Family YMCA joined forces with LakewoodAlive to beautify both the front and backyards of this Lewis property in less than three hours. And they clearly enjoyed themselves while doing it, utilizing a truck to remove a stubborn bush and capturing part of their landscaping efforts with a GoPro camera. The pair of beautification initiatives represents the 14th and 15th volunteer projects completed by LakewoodAlive thus far in 2016, with no end in sight. No matter the origin of the group nor the scope of the undertaking, when you combine LakewoodAlive project coordination with a motivated group of volunteers, Lakewood’s neighborhoods and residents stand to benefit. An awesome thing, indeed.